Conservatories have long been a part of British homes. Thanks to their ability to be crafted mainly off-site, they’re a cost effective way for many families to expand their homes. Yet, as a time honoured classic, they also have a tendency to be… a little dated. With cheap uPVC frames, they can often warp overtime, and even devalue the price of a home, if poorly designed. Because of these faults, in recent years, the conservatory has undergone somewhat of a makeover. Transformed into a stylish addition, capable of bringing both space and light into a home. Lean to conservatories aren’t particularly new, in fact they’ve been around for quite a while. However, it’s the way they’re now being crafted that gives them a new modern twist. Instead of bulky, and cheap, uPVC white frames, many are now being constructed from aluminium with a much bigger emphasis on glazing. This means they’re easier to blend with classic brickwork, and that traditional slope gives those clean lines many architects are now favouring. In the past, their simple shape has made them a popular choice for homeowners, allowing them to be added to homes big and small. And with their modern upgrade, we can’t see their popularity giving out anytime soon. When conservatories originally came about in the Victorian age, they were mainly used as a greenhouse. A way for people to enjoy their plants, without having to go outside - a wise move, in a time without proper medicine. However, over the years, more and more people started to use conservatories as a cost effective way of expanding their living space - losing that outside aspect. Well, that seems to be changing, as our love for houseplants has been soaring in the last few years. Now, more homes are reclaiming their conservatories as green havens. This brings not only a wonderful, green aesthetic to the home, but also a range of health benefits. Don’t forget that plants are natural air purifiers! If there’s one thing we love it’s vintage. Classic styles that have been left behind, somewhere along the way. One such trend, that seems to be making a comeback, is gothic style architecture. Creepy arches, and delicate metalwork, are the perfect historical touches for your conservatory. Not only does this style add a sense of grandeur to your home, they’re also a perfect addition for period property owners. Let’s face it, what’s the best part of a conservatory? The glass! Being able to sit back and survey the horizon is a dream for many homeowners. That’s why many designers are now going all out and creating wonderful fully glazed structures. Now it’s worth pointing out that there’s a price to pay for these glazed home additions - a very literal price. Fully glazed elements are very expensive, as they require glass that has structural elements. 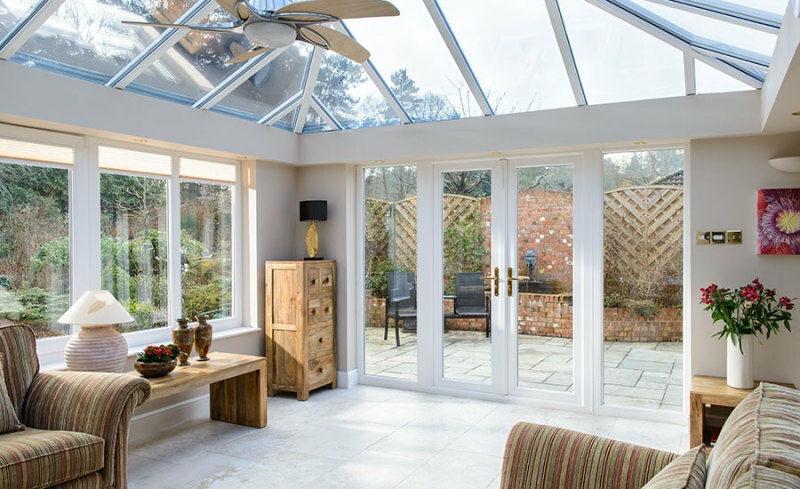 Not to mention, you’ll want to splash out on thermal-control glass, so your conservatory doesn’t overheat in summer and become freezing in winter. Often, when we talk about modern design, we’re discussing lots of glass and metal. And while these features are great, let’s not neglect those more natural materials. Such as our good friend oak! Using wood as your conservatory’s frame material is a sustainable way of creating a cosy space for either curling up in, or entertaining. There are plenty of sustainable suppliers in the UK, so you know your extension isn’t costing the earth. What’s more, with regularly treatments, a wooden frame can even outlast it’s uPVC and aluminium counterparts.